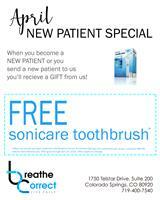 New Patients get a FREE Sonicare Toothbrush! Come see how we are changing our patients lives by getting them better sleep & straightening their teeth at the sam time! A Healthier Alternative to Braces! Angie’s Carpet Care serves hundred of clients in Colorado Springs, Larkspur, Monument and Castle Rock. Angie’s certified technicians use powerful truck mounted cleaning systems to clean your carpet, upholstery and ceramic floor tile. Fine area rugs and throw rugs can be cleaned at our area rug cleaning facility in Colorado Springs. Plan to spend about 2 hours in my in-home studio. Tuesdays and Thursdays by appointment only.